Greenstone Homes – the company behind the revitalization of Kendall Yards in downtown Spokane – has long projected an environmentally-friendly image. Kendall Yards’ master plan, for example, calls for it to be the first neighborhood in the city to earn LEED neighborhood development certification. So why is the company being fined for chopping down trees? The Department of Ecology says the trees were within 50 feet of the shoreline, a violation of regulations. “It takes away habitat and bird nesting area and it takes away shade,” Ecology spokeswoman Jani Gilbert says in an email. “That destroys the character of the natural shoreline. “In 2010 Greenstone sought and was denied authorization from Spokane County Planning to remove the… cottonwood trees,” Gilbert adds. But Jim Frank, owner of Greenstone, disagrees. A controlling interest in the property in question – MacKenzie Beach, in Liberty Lake – was purchased by Greenstone precisely to ward off high-density urban development that could harm the environment and frustrate neighbors, Frank says. The neighborhood specifically asked Greenstone to purchase it. But in 2007, while tearing down several crude cabins in the area, they marked several “dead or diseased” trees for removal, Frank says. The DOE agreed the demolition permit was valid, Frank says, but asked him not to tear down the trees. For three years, Frank says, they worked on the rest of the project, reducing the density, the number of lots, and donating land and public access points to the county. And then Greenstone tore down “six or seven” of the cottonwood trees, Frank says. They were never denied permission from the Department of Ecology, he says. That’s because, Frank says, they don’t need it. He cites several exemptions for cutting down trees in the shoreline rules: Preparation for a single family home, activities that cost less than $5,000 dollars, and tree removal that specifically follows forestry policies – no clear cutting – can all be exempt from a shoreline permit, Frank says. Here may be the point of contention: Frank says the trees removed were between 50 and 100 feet away from the shore, where DOE says they were within 50 feet or closer to the shore. Usually the Department of Ecology sends out a notice of correction first before leveling a fine. But Gilbert says that since Greenstone was warned not to remove the trees in 2007, a fine was issued immediately. 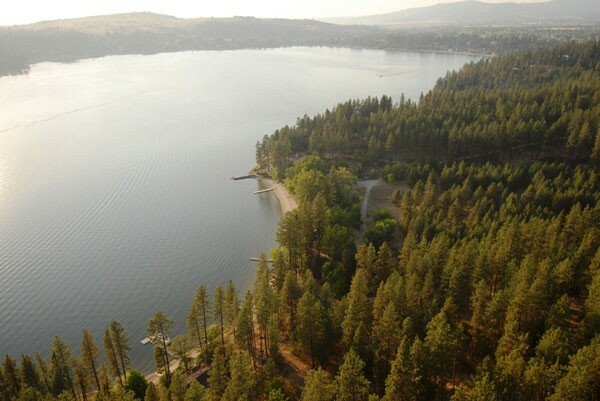 According to the DOE, Greenstone must also cease all “clearing, grading and excavating within 200 feet of the ordinary high water mark of Liberty Lake until the current violation is resolved with Ecology.” Non-compliance costs $1,000 a day.